The ENCTDR100 is a white fiberglass-reinforced polyester enclosure that protects the TDR equipment from weather, condensing humidity, and dust. 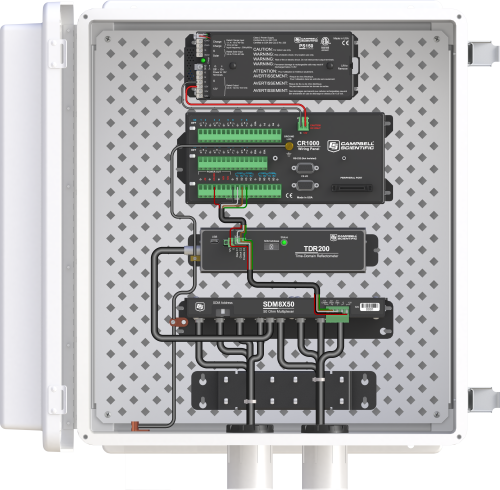 With internal dimensions of 16" x 18" x 8", it can house the data logger, power supply, TDR200, and SDM8X50-N. Note: In the image above, the ENCTDR100 is shown with the SDM8X50, PS150, TDR200, and CR1000. These items are sold separately. The ENCTDR100 (TDR System Enclosure) includes a coaxial cable, enclosure cable, and conduit ports that enter the enclosure at the back plate level to reduce coaxial cable bending stress on the TDR100 and/or SDMX50SP equipment BNC connectors. The ENCTDR100 has enough space for a battery/regulator, data logger, TDR100, and one SDMX50SP.